Jan Rabaey have been appointed honorary doctor at Faculty of Engineering LTH, by suggestion from EIT. 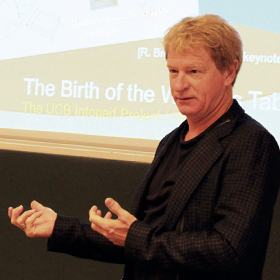 Together with another honorary doctor with connection to EIT, Robert Brodersen, he pursued the Infopad-project between 1992 and 1997 which now, 20 years later, may be considered accomplished with iPad as a splendid example. Highly appreciated. Jan Rabaey has made a strong impression at EIT during his career, and is therefor honoured with being appointed honorary doctor at LTH. He was born in Veurne, Belgium in 1955 and got a Master's degree (1978) and a Ph.D. in Applied Sciences (1983) at Katholieke Universiteit, Leuven. His career continued to the U.S. and University of California, Berkeley 1987 where he's still active. During the years, Jan Rabaey's been a visiting professor at several universities all over the world - in Italy, Japan, the Netherlands and Australia. Jan has been a pioneer in the development of design methodologies for integrated circuits and one of his most popular works is the book Digital Integrated Circuits (1996) which has become the standard basis for teaching the subject at many universities worldwide - including LTH. Jan and LTH got in contact at an early stage, a contact that is ranked invaluable for EIT. Together with Robert 'Bob' Brodersen - who's also a professor at Berkeley and was appointed an honorary doctorate at Lund University in 1999 - Rabaey pursued the Infopad-project between 1992 and 1997. It was almost 20 years ago - and the result can be seen today through the most various surf boards that are on the market, where iPad is perhaps the most famous one. Jan early realized the potential of wireless communications and created Berkeley Wireless Research Center (BWRC) 10 years ago, something that counts as a world-leading research centre in wireless communications, combined with hardware. This has had great influence to EIT. The contact with Jan Rabaey is also behind much of the EIT's success in electronics design. For instance, a number of PhD students have spent time with Rabaey at Berkeley, including the head of EIT Viktor �wall who involved Jan to the International Advisory Board (IAB) in the research centers CCCD (1998-2007) and SoS (2008 -). Rabaey's role involves advice on research direction and about how to lead major research centers. He has also participated in workshops and even in the classroom. - Jan has been invalueable for SoS, when it comes to both preparing the application and to lead and pursue the centre, and I value his preferences a lot also for the future. His inspiration and support is essential for the activity in electronics and communications at EIT, Viktor �wall says. Jan Rabaey will officially recieve the honour in connection with the ceremony May 25, 2012. Hopefully there will be chances to listen to Jan Rabaey at EIT around this period, before returning to California for further research and perhaps even relaxing - or hard work? - At his own winery in Calistoga, Napa Valley. Portr�tterad. Lars-Erik Wernersson st�r i rampljuset p� LTH.se. N�r grundforskning i fysik m�ter den mer till�mpade elektrovetenskapen uppst�r ljuv musik. �tminstone har det varit s� f�r Lars-Erik Wernersson, professor i nanoelektronik. � De elektroniska till�mpningarna tenderar numera att sm�lta samman med de fysiska lagarna. Det �r oerh�rt sp�nnande, man vet inte alltid p� f�rhand var man hamnar, s�ger han. L�s hela artikeln p� LTH:s hemsida. "Vi bedriver forskning p� v�rldsledande niv�"
Telekombranschen utvecklas st�ndigt. F�r att kunna svara upp mot morgondagens tekniska �nskem�l och krav har man byggt upp forskningscentret System Design on Silicon, SoS. H�r m�ts industrin, universitetet och forskare f�r att tillsammans investera i framtiden. � Vi p� Ericsson finns med och sponsrar det h�r centrat och vi g�r det inte av altruistiska orsaker. V�rt engagemang bygger p� att vi vill s�kerst�lla framtidens telekomproduktion. Det g�r vi genom att se till att v�ra grundutbildningar inom universitet � och h�gskolan h�ller h�g kvalitet. D� f�r vi ingenj�rer som �r v�lutbildade och som har den spetskompetens som vi inom industrin be-h�ver. Dessutom f�r vi en forskning som h�ller h�g kvalitet, vilket gynnar b�de industrin och universitetet, ber�ttar Sven Mattisson, som f�rutom att han �r senior expert p� Ericsson och ordf�rande i SoS, dessutom �r adjungerad professor i analog systemkonstruktion vid Lunds universitet. P� SoS forskar man inom avancerad elektronikkonstruktion, vilket man �r oerh�rt skickliga p�. � Vi bedriver forskning p� v�rldsledande niv�, framf�r allt vad g�ller integrerade kretsar, vilka �r sv�ra och dyra att g�ra. Forskningen som bedrivs h�r i Lund ligger p� en v�ldigt h�g niv�. En integrerad krets �r lika stor som en nagel, men av den kan man bygga en kraftfull dator eller radio. Varje liten krets inneh�ller m�nga delar och funktioner. � Vi pratar om storlekar under hundra nanometer, allts� en tusendel av ett h�rstr�. Sett ur det perspektivet kan man f�rst� att det f�r plats ganska mycket p� en krets, stor som en nagel. Projektet �r bland annat finansierat av den statliga myndigheten Vinnova samt f�retagen Sony Ericsson, ST-Ericsson, Ericsson, Infineon och Cadence. Projektpengarna som man beviljats ger centrat m�jlighet att arbeta l�ngsiktigt. Viktor �wall �r professor i elektronikkonstruktion vid Lunds universitet och f�rest�ndare p� SoS. � Fr�n universitetets sida ser vi att samarbetet med industrin �r v�ldigt viktigt. I det h�r projektet har vi t�mligen l�ng tid p� oss att arbeta. F�r v�r del som forskare inneb�r det att vi kan vara mer strategiska. Vi l�ser inte industrins problem i dag, men vi kan bidra till att f�rst� relevanta problem som man har inom industrin f�r att f� fram resultat som �r bra och viktiga f�r de deltagande f�retagen och f�r Sverige. Artikeln �r publicerad som en del i annonsbilagan "Innovation och forskning" i Svenska Dagbladet (9/12-11) och Sydsvenskan (12/12-11). Nedelko Grbic is one of EIT's newest employees. His heart beats extra for digital signal processing, and in addition to teaching at LTH, Nedo�s looking forward to creating personal control of the acoustic environment in the project �cyber-ear�. 'Nedo' during a session in digital signal processing. He was born in �lmhult 1971, a PhD in signal processing, and currently an associate professor of applied signal and has a lectureship at Blekinge Institute of Technology where he works part time. The other half of the professional life is exercised at EIT where the initial role is temporary teaching resource in the digital signal processing. - I would like to see a continuation of this. Right now I teach digital signal processing and will keep a project course in digital signal processors in the beginning of next year. Signal processing can be seen as a combination of mathematics, electrical engineering and physics, where the goal is to adjust the various signal�s contents to better suit the purpose, says �Nedo�. It seems that "Nedo" passionate about both sides of the academic profession. - The best thing about teaching is that young people's drive and curiosity gives a lot of energy and inspiration to me as a teacher. In addition, you meet many potential top engineers at an early stage, says �Nedo� who are prepared to move closer to Lund eventually. - My plan is to work with my family moving to Sk�ne in the next year. In addition to more education �Nedo�s looking forward to do some research at LTH. - We humans are very accustomed to using glasses in many different contexts, such as protective eyewear, corrective eyewear and absorbing eyewear (sunglasses). The project aims to create this for the ears, says Nedelko �Nedo� Grbic concludingly. N�r grundforskning i fysik m�ter den mer till�mpade elektrovetenskapen uppst�r ljuv musik. �tminstone har det varit s� f�r Lars-Erik Wernersson, professor i Nanoelektronik. 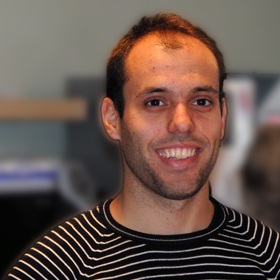 Luca Fanori is one of EIT�s newest co-workers. He�ll be involved with the DRAGON-project lead by Pietro Andreani. 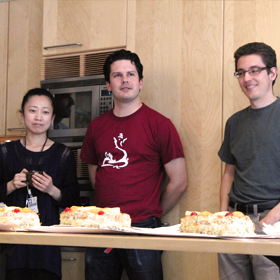 Luca Fanori at a recent cake-event at EIT, celebrating two VCO papers for the next ISSCC. If there�ll be any spare time the 27-year old native Italian from Pavia (northern, central Italy) would love to spend it with sports. - In particular I�m a good swimmer. I was in the team of my region, but I like also sailing and fishing. In general, I like spending my free-time practicing a lot of sports. In Italy I was used to swim more or less every day, to play volleyball and biking. In Sweden at the moment I play in a volleyball team with friends, while it is not very easy to combine the work whit the swim trainings. Luca�s actually been in Sweden for almost a year already. - I spent the first 3 months here at the university hosted by Piero Andreani, and then I was in Ericsson AB for a Marie Curie project which involved my university of Pavia, the Lund University, Ericsson AB and Marvell, Luca tells me � and he wasn�t too impressed with the harsh climate at the time of his arrival. - When I arrived in Lund last January it was not very easy to meet new friends since the weather, the darkness and the temperature didn't help. Anyway I loved the spring and the summer and the long light days spent with friends in Lund, Malmo and Copenhagen. It seems like Luca Fanori�s settled in Sweden and Lund. - I don't miss anything about Italy, actually. Sweden is really close to Italy and when I need to come back home for a few days it�s very easy. Just to be unoriginal I could say what I miss is the good foods, he says and smiles. - At the moment I am living in Linero but I am looking for an apartment downtown. Luca Fanori got an electronic engineering education in his hometown Pavia, and continued on with the PhD studies which were finished this October. - My research activity was focused on designing Digital/Voltage Control Oscillators and Digital PLL. This offered me the opportunity to join some of the most important conferences where we presented our works. I particular, I presented a DCO with high frequency resolution at ISSCC '10. I was stationed between the authors of ADPLL proposed at the CICC conference last September and I am going to present two other papers at ISSCC next February, whose task was the design of oscillators that could achieve the performance required by the newest communication standards saving the power consumption. It is important to improve the duration of the battery, since the oscillator and RF blocks consume a lot of energy, says Luca dedicatedly. His skills are about to be used in the DRAGON project, which is lead by Pietro Andreani. - The DRAGON project is an European project which involves different universities and companies. The goal of my research activity is the design of oscillators with high power efficiency. It follows what I researched during the last part of my PhD studies. At the moment I am studying new architecture. And scince both Luca and Pietro are Italian, I just had to ask if there was some kind of earlier connection between them. - Well, I met Piero the first time in Pavia a few years ago when he presented his tutorial. We talked about my researches some times after that. We started working together last January and I discovered that he�s also from La Spezia, the city close to the village from where my family comes. Den 26 oktober beslutade Vetenskapsr�det om ans�kningar inom naturvetenskap och teknikvetenskap. I �r utlystes b�de Projektbidrag och Projektbidrag unga forskare inom naturvetenskap och teknikvetenskap. P� LTH�s hemsida ber�ttar Thomas Johansson om "Attacker i s�kerhetens tj�nst". Frida Sandberg won the competition on the "Young Investigator's Award" which took place at the international conference "Computing in Cardiology," September 18-21, 2011, in Hangzhou, China. Awarded yound researcher. 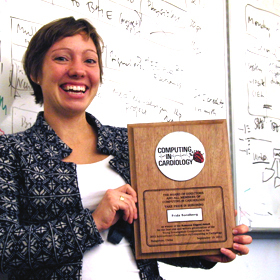 Frida Sandberg brought the honour, the money and a nice plaque from the Computing in Cardiology conference in China. The contest is designed to encourage young researchers up to the age of 36 to present their work and let it be discussed by and before an audience. Among the contestants therer are both engineers and physicians. - This was the third time I attended the conference, which is unique of its kind. It�s very specific to cardiology, and the mix of engineers and physicians is very special and opens up some interesting discussions with quite different views, says Frida Sandberg. Starting off as a civil engineering student at the fall of �97, Frida changed to electrical engineering in 1999. Immediately after the master�s thesis in 2003, she started as a PhD student at the Signal processing group at EIT. - The Signal processing group was already researching on hearts, and all of a sudden so was I. It was pretty coincidental. But I like it a lot, I like the direct benefit of it and that the research results gets used immediately. Frida�s contribution, �Model-based analysis of the ventricular response during atrial fibrillation� (With V.Corino and L. Mainardi (Milan) and L. S�rnmo as co-authors) is about the most common heart arrhythmia � atrial fibrillation � which may cause clot formations and lead to disorders such as stroke. - What I did was a mathematical model for the function of the AV-node which is located between the atria and the chambers. It can block the electrical impulses from the atria and thereby prevent the heart from beating infinitely fast which it�s not capable of handling. Fron an ECG signal, the characteristics of the AV node may be estimated. The model can be used to see how well different drug works, without surgery, Frida explains. Four out of 24 applicants are selected to take part in the final. During the finale, the finalists made oral presentations of 15 minutes, with five minutes of subsequent discussions. - It was a little nervous, of course. But fun, above all! There was some good comments and I got nice feedback. A jury appointed the winner who was awarded with a total of $1200 and a proper plaque as an eternal proof of success. - What I�m going to do with the money? Haha, well, I don�t know! I haven�t cashed the checks yet. But I bought a new computer recently, so I guess the money will come in use, says Frida and finishes off with a winning smile. This keynote will focus on CMOS circuits which operate in the sub-threshold regime. Typical application areas for these circuits are systems which only require low- to moderate clock speeds, e.g., wrist watches, biomedical applications, or sensor networks. Aggressive voltage scaling to levels below/around the threshold voltage is a very popular technique to reduce the overall energy cost. Unfortunately, voltage scaling comes with the penalty of performance degradation, and consequently, optimization techniques which remedy such penalty need to be considered. In this talk, various design strategies for sub-threshold CMOS circuits will be addressed. Optimization techniques in the sub-threshold regime which increase energy efficiency and boost processing performance will be discussed, e.g., pipelining, clock gating, retiming, dual-VT, time-multiplexing, etc. Moreover, it will be shown how energy can be further reduced by full-custom design of some critical gates. In order to evaluate sub-threshold circuits, an energy characterization model that utilizes data generated by a commercial ASIC design flow will be presented in line with synthesis strategies for various types of standard cell libraries. Furthermore, the advantage of integrating standard-cell memories (SCMs) will be presented. Finally, a physical routing strategy will be presented along with some sub-threshold circuits that have been fabricated and measured. The board of LTH has decided that Dr Rebecca Seviour from the physics department at Lancaster University will be a Lise Meitner Professor at EIT for the period October 1, 2012-June 30, 2013. Rebecca Seviour. Foto: Lancaster Univerity. Rebecca will belong to the Electromagnetic group and take part in both research and teaching. Her research covers areas as superconducting cavities in accelerators, metamaterials and wave propagation in complex media. Her interest in accelerators will strengthen the connections between EIT and ESS. The aim of the Lise Meitner professorship is to offer a distinguished female researcher the opportunity to work at LTH for a period of 6 months to a year, and to be a role model for other women at LTH. The professorship was created in January 1999. More info on the Lise Meitner Professorship. ��Influence on the Ear-to-Ear Link Loss from Heterogeneous Head Phantom Variations�� by Rohit Chandra and Anders J Johansson for the SEMCAD X Student Research Award 2010. The paper has been published in the Proceeding of the 5th European Conference on Antennas and Propagation, 2011 (EuCAP 2011). In February, Pietro Andreani gave a 1.5 hour tutorial lecture at the ISSCC held in San Fransisco. He also presented it at several well-known universities around California and Europe. We asked him to tell us more about it. He did. Enjoy! The International Solid-State Circuits Conference (ISSCC), held every mid-February in S. Francisco, California, is by far the most important conference in the field of integrated circuit design. Since 2006 I have been a member of the technical program committee (TPC) of the ISSCC, where I belong to the RF (radiofrequency) sub-committee. There are 10 different subcommittees, covering all branches of IC applications, and every year one member of each subcommittee is entrusted to deliver a 1.5-hour tutorial lecture on a relevant topic of choice. This year Lund was granted the honor of having no less than two ISSCC tutorial speakers: Dr. Sven Mattisson, Senior Expert at Ericsson Research and member of the wireless subcommittee, with a tutorial on �Distortion in cellular receivers�, and myself with �Integrated LC oscillators�. Oscillators (or more exactly voltage-controlled oscillators, VCOs) based on the so-called LC tank (L being an inductance, C a capacitance, and both working together as an energy reservoir, or �tank�) are used to generate various frequencies on-chip, and as such are truly key blocks in today's and tomorrow's radios. ISSCC tutorials are usually very well attended, with 100-200 attendees per tutorial, and present an excellent opportunity for an IC designer to get quickly in touch with the basics of a new field, while the ISSCC-subcommittee affiliation should vouch for the quality of the speaker. In turn, the tutorial yields also an opportunity for the speaker to present his own view over a particular field. Indeed, I took the chance of treating a few issues in VCO design that are often misunderstood, and not only by beginners. While in California, I also took the opportunity to present the tutorial at other places than the ISSCC, namely Stanford University (guest of prof. Murmann), UCLA (guest of prof. Razavi), Caltech (guest of prof. Hajimiri), and Broadcom (a company located in Irvine, CA, and one of the major commercial actors in the radio IC market). In all these occasions I had the pleasure to have numerous and interested listeners, which made this tour a rather tiring but very rewarding experience. At both UCLA and Caltech I also presented an ISSCC�11 paper on the latest, state-of-the-art radio IC by ST-Ericsson in Lund, where I work 1 day/week: �A 9-band WCDMA/EDGE transceiver supporting HSPA Evolution�, by Magnus Nilsson et al. (Magnus Nilsson had presented it at the ISSCC a few days earlier). Finally, an augmented, 3-hour-long version of the tutorial was presented in March at IMEC in Leuven, Belgium, as a so-called IDESA seminar. IDESA is Framework 7 project supported by the EU, helping universities to follow the fast pace of evolution of the IC design in nm CMOS processes. The seminar was delivered in front of a small (some 20 attendees) live audience, but the main goal for the IDESA seminars is to be bought and downloaded by a number of European universities. For the near future, there are plans to present the tutorial at the 2011 NORCHIP conference, which will be held in Lund in November 2011. This tutorial lecture will go through the fundamentals of LC voltage-controlled oscillators (VCOs) integrated in CMOS processes, starting with basic linear and non-linear circuit analysis, and continuing with a rigorous yet intuitive time-variant theory of phase-noise capable of capturing the complex behavior of noise conversion into phase noise. Design for low power, low phase noise and large tuning range will be given the relevance it deserves, focusing primarily on the choice of inductor, switchable capacitors for discrete tuning, and varactors for continuous tuning. The lecture will also include other key issues such as supply pushing, LDO-VCO co-design, routing/buffering the oscillator signals in large SoCs, and PLL-VCO co-design for fully integratable frequency synthesis. The goal it to give a thorough overview, easy to follow yet comprehensive and in touch with the latest significant research results (e.g. DCOs with extremely fine tuning steps for use in DPLLs), of one of the truly key blocks in today's and tomorrow's radios. Frida Sandberg har i stark konkurrens blivit utsedd till en av de 4 finalister som deltar i t�vlingen om "Young Investigator's Award". Detta pris delas ut vid den internationella konferensen "Computing in Cardiology" som �ger rum den 18/9�21/9, 2011 i Hangzhou, Kina. Hennes f�redrag har titeln "Model-based analysis of the ventricular response during atrial fibrillation" med V. Corino och L. Mainardi (Milano) och L. S�rnmo som medf�rfattare. Vi har ett nytt EIT-rekord i accepterade artiklar till European Solid-State Circuits Conference (ESSCIRC) genom Jonas Lindstrand, Carl Bryant och Ping Lu som f�tt varsitt bidrag accepterat. Triss i ESS(CIRC). Ping Lu (t.v. ), Jonas Lindstrand (mitten) och Carl Bryant (t.h.) representerar EIT p� ESSCIRC 2011. Mellan den 12 och 16 september finns EIT allts� representerat trefaldigt p� European Solid-State Circuits Conference (ESSCIRC) i Helsingfors, den st�rsta konferensen inom IC-konstruktion i Europa. 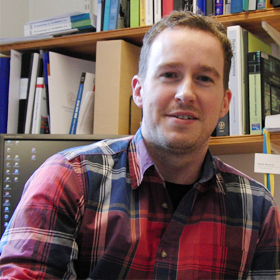 Jonas Lindstrand har konstruerat en RF-effektf�rst�rkare f�r cellul�ra applikationer. F�rst�rkaren har en h�g verkningsgrad och bygger p� CMOS-teknologi vilken �r billigare �n andra mer exotiska teknologier � dvs. ger en motsvarande verkningsgrad till en billigare peng. � Jag tror det �r den f�rsta krets med uteffekt p� 1 W som gjorts p� EIT, ber�ttar Jonas efter att ha �kt slalom i den egna artikeln och s�llat vad som f�r n�mnas och vad som b�r h�llas hemligt ett tag till. Carl Bryant agerar medf�rfattare p� Lindstrands bidrag, men st�r som f�rstaf�rfattare p� en annan ESSCIRC-accepterad artikel. � Den handlar om en RF-mottagare med ultral�g effektf�rbrukning. Den �r en del av ett st�rre projekt d�r vi vill skapa en hel mottagarkedja. Mottagaren vi skapat �r kompakt och �r t�nkt att kunna anv�ndas i t.ex. sm� sensorer i medicinska implantat d�r batteriet ska klara sig flera �r. Den aktiva effektf�rbrukningen f�r hela mottagarkedjan ska vara under 1 mW, den h�r mottagaren drar mindre �n h�lften av det, ber�ttar Carl innan han sl�r �nnu ett �ga p� klockan och konstaterar att det �r dags att �ta t�rta. Ping Lu har har konstruerat en s� kallad time-to-digital omvandlare (TDC). � Digitala PLL:er (DPLL) �r mycket popul�ra block som dragit till sig en enorm uppm�rksamhet p� senare tid, och det med all r�tta, eftersom en DPLL kan styras p� ett mycket enklare och avancerat s�tt �n en analog PLL. Ping forskar l�ngsiktigt p� DPLL:er, och i det h�r fallet har hon konstruerat en ny TDC (som �r ett nyckelblock i alla DPLL:er), baserad p� ett nytt koncept, som kan uppn� en h�gre uppl�sning �n befintliga TDC:er, meddelar Ping Lus medf�rfattare Pietro Andreani. On May 5 and 6 the persons who have been selected for interviews and trial lectures for the new Professor positions at EIT will visit LTH. The lectures are open to all and the department management are hoping to see many from EIT there. Presentation in Network Architectures and Services: The candidates are invited to give a trial lecture with the aim to inspire students to the subject Network Architectures and Services. The presentation shall be directed to new students at Master level. Time for the presentation is set to 20 minutes + 5 minutes for questions and it should be made in English. The trial lecture is open for the public and will be announced at the department. Leandros Tassiulas has been invited for both positions but will only give one lecture. 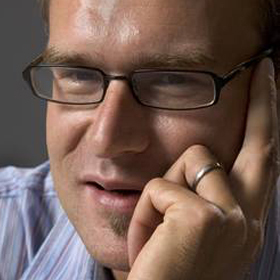 Joerg Kliewer have been invited for the position in Communications Engineering and will give a lecture on May 13. Subhrakanti Dey will not be able to participate (due to illness) May 6th. Please note that Christian Schlegel will start at 09.00 AM. The focus of the research project is on ultra-low power digital circuit design. During the course of the project power optimization techniques from architectural down to transistor level will be investigated for their suitability and efficiency, if the circuit is operated under a scaled supply voltage. Furthermore, clocking strategies like globally asynchronous and locally synchronous (GALS) will be investigated. The PhD student will participate in an Industrial Excellence Center supported by VINNOVA and industrial partners entitled "System Design on Silicon" ,www.eit.lth.se/sos. The position is full-time, which includes 15% department work, mainly teaching. HsWC-g�nget har lyckats visa resultat p� tr�dl�s �verf�ring med en hastighet av 4 Gbit/s med en enkel modulation, s� kallad onoff-keying. Rekordinnehavare. Mats �rlelid (bilden) �r tillsammans med Lars Ohlsson, Lars-Erik Wernersson, Erik Lind och Mikael Egard sannolikt v�rldsrekordh�llare i tr�dl�s data�verf�ring med s.k. onoff-keying. � Det grundar sig i dagens behov av snabb, tr�dl�s kommunikation. Det �r inget problem att till exempel stoppa in ett stort minne i en systemkamera, men det �r drygt att sitta och v�nta n�r bilderna ska �verf�ras till en dator. Fr�gest�llningen var � vad man kan g�ra f�r tr�dl�s h�ghastighetskommunikation med en enkel modulation, exempelvis en impulsradio p� 60 GHz? � Vi har visat upp resultat p� 4 Gbit/s med en enkel modulation, s� kallad onoff-keying, f�rklarar Mats. Och med det resultatet �r gruppen b�st i v�rlden. � Vad vi vet har ingen gjort s� h�ga bithastigheter med den h�r typen av modulation. Man kan g�ra den typen av hastigheter med mer sofistikerade typer av teknik, men systemet blir betydligt mer komplicerat d�. Microwave Theory and Techniques (MTT) har publicerat en l�ngre transaktion som beskriver hur kretsen opererar i pulserat l�ge. � Det har handlat om hur man optimerar effektf�rst�rkningen i den h�r sortens kretsar. Tidigare har man visat att om man g�r oscillatorer med resonanta tunneldioder s� blir effektiviteten v�ldigt l�g. Men vi har visat att om man g�r en pulsad oscillator s� kan man optimera energif�rbrukningen per bit. Och den typen av kretsar kan man anv�nda f�r tr�dl�s h�ghastighetskommunikation. Om gruppens forskningsresultat kommer att resultera i en faktisk produkt �terst�r att se. Mats �r ganska f�rtegen kring detta. � Man kan v�l s�ga att det �r applicerbart f�r industrin, s�ger han avslutningsvis och ler. 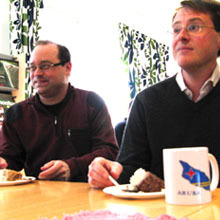 Mats Gustafsson och Daniel Sj�berg har utn�mnts till professorer i Teoretisk elektroteknik. De b�da har varit professorer sedan i torsdags och idag firades de med t�rta p� institutionens eftermiddagsfika. Firade med t�rta. EIT:s f�rskaste professorer (Daniel Sj�berg t.v., Mats Gustafsson t.h.) k�nde smaken av framg�ng. – Vi p� EIT �r v�ldigt glada �ver att Mats och Daniel har blivit befordrade till professorer. Utn�mningarna kommer att st�rka forskningen inom �mnet. �ven om namnet �r Teoretisk elektroteknik har det m�nga praktiska till�mpningar s�som antenner f�r mobiltelefoner och radomer f�r flygplan, sa Viktor �wall. EIT:s f�rskaste professorer smakade p� t�rtan under tiden som en annan professor i Teoretisk elektroteknik, Gerhard Kristensson, talade om dem. – Det h�r �r f�rvisso inte slutstationen, det �r en h�llplats. Det �r nu det roliga b�rjar! Till grund f�r utn�mningarna ligger m�nga �rs h�rt arbete vid institutionen med publikationer, kurser, handledning av doktorander och inh�mtade forskningsanslag. – Ni har en fantastisk uppfinningsrikedom, ni sprudlar av id�er. Ni har ocks� b�da n�sor f�r vad som kan vara lyckat. Ni har en fantastisk potential vad g�ller framtiden, jag ser framemot att se vad ni kommer att �stadkomma, avslutade Gerhard. Festf�rem�len sj�lva tackade f�r uppvaktningen och gladdes �t sina respektive utn�mningar, och varandras, men ut�ver uppdragen att h�lla varsin krukv�xt levande ett tag gav de inte uttryck f�r n�gra revolutionerande f�r�ndringar i livet i �vrigt. – Men i �vrigt kommer vi att forts�tta som vi gjort. Eventuellt kommer opponentinbjudningarna bli fler, och det �r f�r det allra mesta roligt. – Det �r ett naturligt steg p� den akademiska karri�ren, ett bra avstamp inf�r framtiden. Vi vill skapa �nnu b�ttre forskning och undervisning, det str�var man efter hela tiden, sa Mats. N�gon pojkdr�m som g�r i uppfyllelse �r det dock inte. – Inte direkt! svarar Mats. – N�r jag var liten ville jag bli turist. – Jag har aldrig vetat vad jag velat bli. S� sent som n�r jag b�rjade l�sa p� h�gskola visste jag inte exakt vad jag ville bli � men jag visste att jag ville veta mer, minns Daniel. LTH b�st i ny rankning! Eleverna p� LTH i Lund kan k�nna sig n�jda, enligt en ny rankning g�r de p� det b�sta universitetet inom kategorien Teknik/Naturvetenskap. E-huset. Ett av de b�sta st�llena i Sverige att utbilda sig p�. 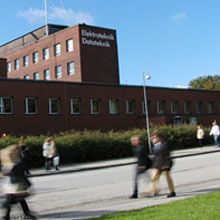 Snart �r det sista dagen att anm�la sig till h�gskolan och universitetet inf�r h�sten 2011. I lagom tid publicerar den frist�ende akademikergruppen Urank �rets rankning av landets st�rsta universitet och h�gskolor. T�ttrion �r den samma f�r fj�rde �ret i rad med Handels i topp f�ljt av Karolinska institutet och Sveriges lantbruksuniversitet, skriver Metro. L�ngst ner p� listan hittar vi H�gskolan V�st och h�gskolorna i Kristianstad och p� Gotland. Urank har �ven rankat l�ros�tena efter inriktning. Lunds universitet toppar bland de tekniska utbildningarna f�ljt av Uppsala universitet och Kungliga tekniska h�gskolan. � Man ska kanske inte ha rankningen som en huvudk�lla vid n�r man v�ljer l�ros�te, men den kan vara v�rd att ta med. Om man �r intresserad av en viss utbildning s� har det betydelse hur l�ros�tet klarar sig inom det omr�det, s�ger Stig Forneng statistiker i Urank till TT. � Denna st�ndiga ranking kan man ju naturligtvis diskutera. Trots detta �r det ju naturligtvis v�ldigt gl�djande nyheter att Lund klarar sig s� bra, kommenterar EIT:s prefekt Viktor �wall. Rolands Parts will visit us next week as an Erasmus teacher (exchange programme within Europe) from Riga Technical University. His area of research is ADSL, in particular measurements. He will make a presentation on Tuesday March 8th in E:3139 at 13.15. There will be time for discussion afterwards. If someone would like to discuss further, please make appointments directly with him. Haruhisa Kawasaki is a Professor of Faculty of Engineering at Gifu University, Japan. His research interests are in the areas of robot control, humanoid robot hand, haptic interface, and rehabilitation assistive robotics. He is a Senior Member of IEEE and a Fellow of the Japan Society of Mechanical Engineers (JSME) and the Robotics Society of Japan (RSJ). He was the National Organizing Committee Chair of the 9th International IFAC Symposium on Robot Control (SYROCO 2009). He has received the Best Paper Award in WAC2004, the Prizes for Science and Technology, Ministry Award by MEXT-JAPAN in 2006, Industry-Academia- Government Collaboration Promotion Award, Ministry Award by MIC-JAPAN in 2010 and so on. It was a grand slam for LTH's electronics research when the Foundation for Strategic Research distributed the money out for the electronic and photonic systems program. A total of 82.1 out of a total 160 million is being purchased by the LTH scientists over the next five years. 27 million goes to Fredrk Tufvesson with a project in distributed antenna systems for high-performance wireless systems. 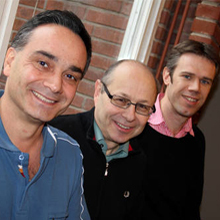 29 million goes to Pietro Andreani with the project DARE - Digitally Assisted RadioEvolution. 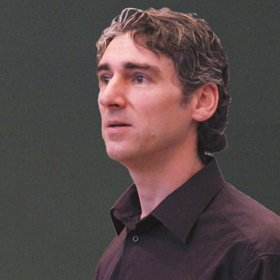 26 million goes to Krzysztof Kuchcinski with a project on high performance embedded systems. "We assess the strategic relevance and scientific quality of applications and Lund were the frontrunner in this announcement. Lund, Chalmers and Link�ping University seems to be strong in electronics and photonics systems, based on the applications to the SSF's current and previous announcement", said Joakim Amorim, Executive Officer of SSF. By using multiple antennas it is possible to send multiple parallel data streams between mobile and base station, increasing capacity. The technology is already used in fourth generation mobile telephony network, but further development is still necessary. By including a central processing unit to address signals by a so-called distributed system enables higher data rates, lower transmission power and better quality to users in radio cell periphery. Fredrik Tufvesson's project will explore how distributed multi-antenna system should be designed and how best to build simple transmitter and receiver units of the system. Next generation mobile communication, LTE Advanced, is expected to land on the market next year. The technology involves data rates of up to 1000 Mbps on downlink and 500 Mbps in the uplink, and puts new demands on signal processing and processor architecture. The goal of Pietro Andreani's research is to digitally manage and adjust performance for the radio's analog parts with the help of nanometer-sized so-called CMOS circuits. In this way researchers expect to achieve better performance and lower power consumption compared with today's technology. The goal of Pietro Andreani's research is to implement the key elements of LTE Advanced. "Today, hundreds of thousands of transistors can fit on one square millimeter silicon surface. This makes it power-efficient to implement even very complex signal processing algorithms for digital circuits", said Pietro Andreani. Computers have become ever faster by increasing clock speed, but it is no longer. Higher clock-frequency results in a simultaneous increase in energy consumption. To address the need for ever-increasing computing performance and lower power consumption, processors can be connected in parallel. Several slow processors connected together is simply more efficient than one fast processor. The processors will be even more effective if they can be adapted to the end use. So-called reconfigurable processors begin to increasingly replace less flexible, specialized hardware. The flexibility makes it possible to design electronic products that are new standards - although they have not been definitively determined when the product was constructed. Krzysztof Kuchcinskis project will lead to both new reconfigurable processor architectures and efficient ways to program them. The project cooperates Lund team of researchers at Link�ping University and the University of Halmstad in the strategic research center ELLIT, www.elliit.liu.se. Pietro Andreani, Krzysztof Kuchinski and Fredrik Tufvesson.